One nice thing about using the Android Market to get new software for your Samsung Galaxy Tab is that the Market also notifies you of new versions of the programs you download. Whenever a new version of any app is available, you see it flagged for updating. Updating the app to get the latest version is cinchy. From the My Apps list, touch the Update button to update all the apps for which automatic updating is allowed. Some apps must be updated individually. To do so, touch the app in the Update part of the My Apps list. Then touch the Update button to manually update the app. To make updating easier, you can place a green check mark by the item Allow Automatic Updating. Update to apps might also be indicated by the Updates Available notification icon. 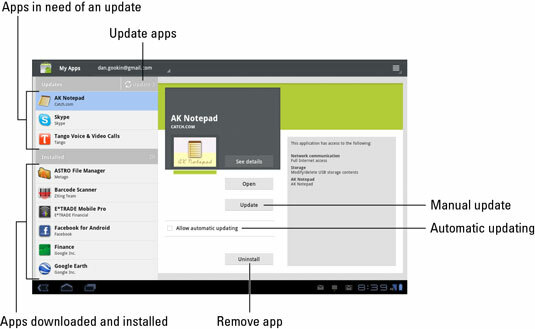 Choose the Updates Available notification to be instantly whisked to the My Apps screen, where you can update your apps.